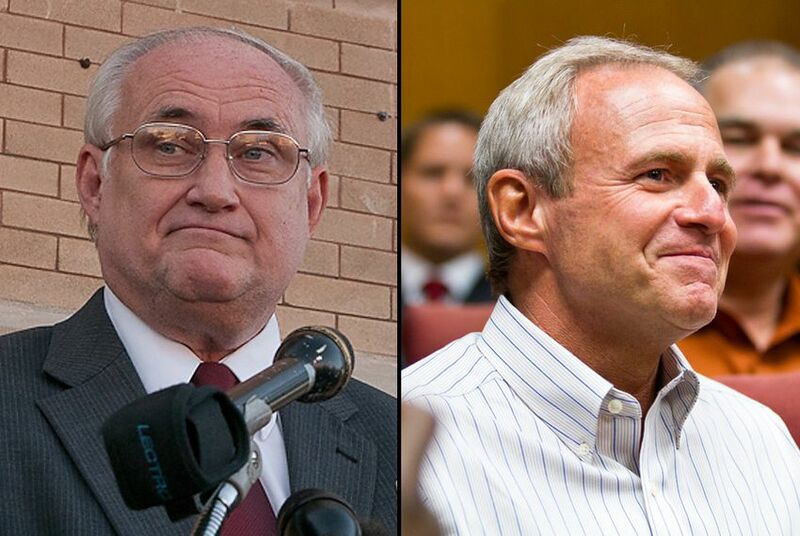 The prosecutor who oversaw Michael Morton's wrongful conviction in 1987 is now facing both civil and criminal legal action and could be disbarred if he is found to have violated professional rules of conduct. On the one-year anniversary of Michael Morton’s release from prison, the State Bar of Texas filed a disciplinary case against the prosecutor who secured his wrongful murder conviction. The lawyer oversight agency alleges that former Williamson County District Attorney Ken Anderson — now a state district judge — deliberately withheld evidence and made false statements to the court during Morton’s 1987 trial. Anderson, who was appointed to the bench by Gov. Rick Perry in 2002 and who the State Bar named “Prosecutor of the Year” in 1995, is facing civil and criminal legal action and could be disbarred if he is found to have violated professional rules of conduct in securing the wrongful conviction. Morton was sentenced to life and spent nearly 25 years in prison for the August 1986 murder of his wife Christine Morton. Anderson has said that he regrets the errors of the justice system in Morton’s case. But he has maintained that he committed no wrongdoing in the prosecution. His attorney, Eric Nichols, said that Anderson disagrees with the positions taken and the allegations made by the state bar disciplinary counsel. “We intend to defend against these allegations in the public forum of a court of law,” Nichols said. Morton was exonerated last year after DNA testing on a bloody bandana found near the crime scene was linked to another man, Mark Alan Norwood, a 58-year-old Bastrop resident who is awaiting trial. His attorney, Russell Hunt Jr., has said his client maintains his innocence in the case. During their investigation, Morton’s lawyers, John Raley, of the Houston law firm Raley & Bowick, along with Barry Scheck and Nina Morrison of the New York-based Innocence Project, discovered evidence that they allege Anderson deliberately withheld from defense lawyers and from the judge in the case. Among those items was a transcript of a phone call in which Morton’s mother-in-law recounted to police a conversation with her 3-year-old grandson, who said he saw a “monster” beat his mother to death. He said Morton, his father, was not at home when the beating happened. Defense lawyers also found a report that Christine Morton’s credit card had been used in San Antonio days after her murder. And they found reports from neighbors who told police that they saw a man in a green van park near the Mortons' home several times before the crime. The State Bar conducted a 10-month investigation after a grievance was filed against Anderson in the case. The State Bar’s Commission for Lawyer Discipline wrote in its court filing that Anderson knew of the evidence and withheld it. The filing also alleges that Anderson made a false statement to the court when he told the judge he had no evidence that could be favorable to Morton’s claims of innocence. His conduct, the State Bar commission wrote, violated five of the state’s Disciplinary Rules of Professional Conduct. Anderson is expected to file a response to the lawsuit by Nov. 5. He can choose between a civil jury trial or a bench trial in which a judge will hear the case. If Anderson’s conduct is found to constitute professional misconduct, the judge will impose sanctions, which could include a public reprimand, probated suspension of his law license, active suspension of his law license, or disbarment. The judge could also force Anderson to pay the attorneys' fees of the State Bar commission. The Texas Supreme Court has appointed state District Judge Kelly G. Moore of Terry and Yoakum counties to preside over the case in Williamson County. “I am confident he will be held accountable," he said. The State Bar has publicly disciplined prosecutors for their errors in court very rarely in recent history. Judges found that prosecutors in those broke basic legal and ethical rules, suppressing important evidence and witness testimony and making improper arguments to jurors. Although the State Bar does not track discipline of prosecutors separately from other lawyers, an official who worked at the agency since 1985 could recall only three prosecutors who were publicly reprimanded. Kim Bueno, spokeswoman for the State Bar, said that the Office of Chief Disciplinary Counsel received 8,135 grievances from June 2011 to May 2012. The counsel determined that 2,296 of the grievances included possible violations of the Texas Disciplinary Rules of Professional Conduct. It filed disciplinary petitions against about 600 of those attorneys. Jennifer Laurin, an assistant professor at the University of Texas School of Law who specializes in regulation of criminal justice institutions, said in an email that the State Bar's action was significant because of its rarity. "Vanishingly few complaints emerge as formal charges from the State Bar disciplinary process," Laurin said. But, she added, the legal action does not indicate a sea change in prosecutorial oversight. "It would be a mistake to conclude from this action that broader issues concerning oversight of prosecutors — either by the State Bar, or by court-enforced rules, or at the level of office policies and supervision — are no longer of concern," she said. State Sen. Rodney Ellis, D-Houston, and chairman of the New York-based Innocence Project, said he applauded the State Bar's diligence in investigating Anderson. "No elected official should ever be above the law," Ellis said in an emailed statement. He added that he hopes other lawmakers will join him in seeking reforms to the criminal justice system to ensure that prosecutors do not hide information and that those who undermine the system are held accountable. "Texans deserve a system where the innocent are protected, the guilty are brought to justice, and the outcome can be trusted," Ellis said. Since his release from prison, Morton has been urging lawmakers to implement reforms that spell out consequences for prosecutors who withhold evidence. Simultaneous with the civil court case against him, Anderson will also face a court of inquiry, a rare criminal proceeding that could lead to charges against him for contempt of court and tampering with evidence. Tarrant County State District Judge Louis Sturns is presiding over that case, and has appointed famed defense lawyer and former prosecutor Rusty Hardin as special prosecutor. A pretrial hearing is set for Oct. 30 in that case, and the inquiry is set to begin on Dec. 10. Hardin declined to comment on the State Bar’s decision but said the civil action would not affect the schedule of the court of inquiry. “I don’t anticipate it will have any effect on our proceeding at all,” he said. Barry Scheck, Innocence Project co-founder, said it was heartening that the State Bar investigation came to the same conclusion about Anderson's role in the case as Morton's lawyers and the state judge who ordered the court of inquiry. "On other hand," he said, "we respect the right of Judge Anderson to get a fair trial, whether it's in the State Bar proceeding or a court of inquiry; although, it is our belief that his actions did not permit a fair trial for Mr. Morton."